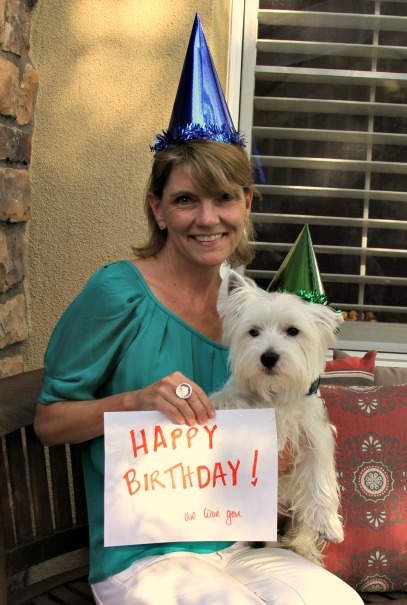 The White Dog Blog: Wordless Wednesday, Birthday Style! Happy Birthday to Dad too. Have a wonderful wordless Wednesday. Duncan, you should be yelling loud about this, never mind wordless wednesday. HAPPY BIRTHDAY DAD, hope they got you some good stuff, like lickies and huggies! Bet that put a big smile on his face. Happy Birthday to your Dad from Gail and I too. Happy Birfday from us too! Dad' going to have to frame that! Happy Birthday to your dad, Duncan! Did you give him something nice? I'm a Westie with way too much energy and terrier-tude! I write with my mom here on this blog because, frankly, I think I'm all that! I tell you about my pup tips, good dog design, great finds for dogs and their people, and sometimes show you what's going on over at our shop, The White Dog Puperie, or www.whitedogpuperie.com if you'd like to go check it out for yourself. Thanks for joining us! Father's Day is for sharing ... right?? Happy Birthday to my best girl! It wan't my fault. Honest. copyright 2011 The White Dog Blog. Powered by Blogger.